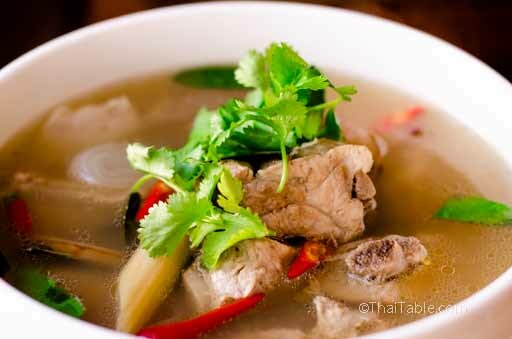 Tom Yum is the type of dish where you can follow the recipe loosely. 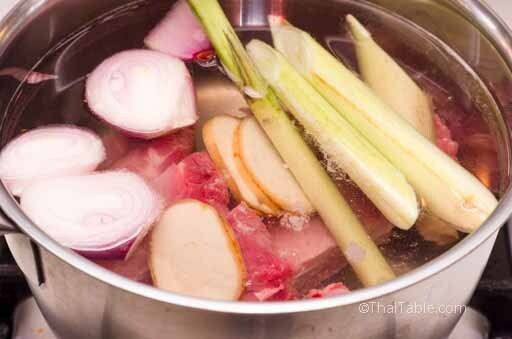 For the most part, you adjust the ingredients as you like and the soup will still taste great. Keep the ratio of lime juice to fish sauce at roughly 1 to 1. Although I like slight more lime juice than fish sauce. You can substitute pork ribs with spareribs, or use both. 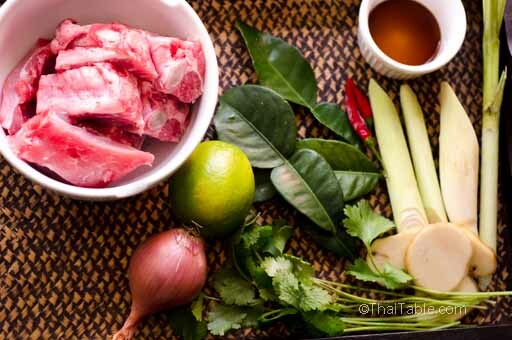 If you are into planning and prepping for meals, the pork ribs can be cooked with galagal, lemongrass and shallots the day before.Then, the next day, all that's left to do is the seasoning. To avoid accidentally chewing on hot chili peppers, I choose red chili peppers as opposed to green ones. So that, they are not blended in with cilantro. And if you want to pick them out, you can do so easily. If you have sawtooth coriander available, replace the cilantro with it. The saw tooth coriander is what we use in Thailand, however, it can be hard to find in the US. 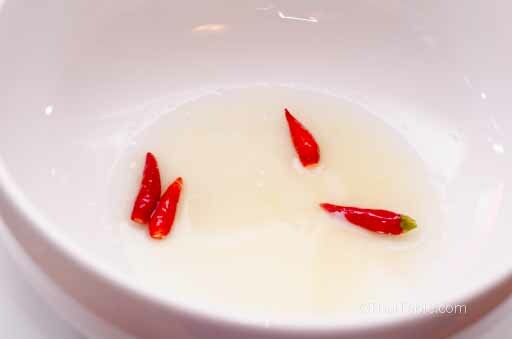 It gives a stronger flavor, perfect for a spicy soup. If you have this tom yum in Thailand, you may see tomatoes. This is a recent addition that an old schooler like me prefers to skip. Slice lemongrass into 4 inch pieces. You can also bruise the lemongrass with a pestle or a heavy knife. Add sliced galangal into a thin pieces, 1/3 of an inch thick. Peel and cut shallots in half to release the flavor. 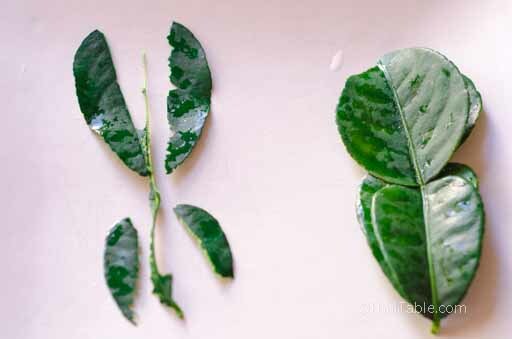 Tear the kaffir lime leaves away from center stem. Cut the cilantro leaves into 1 inch pieces. Discard the stems. Cut the chili pepper lengthwise. Cut the ribs into individual pieces between the bones. Add 6 cups of water to a 2-quart pot over high heat. Add the ribs, lemongrass, galangal and shallots. Let the broth come to a boil then turn down the heat to simmer. 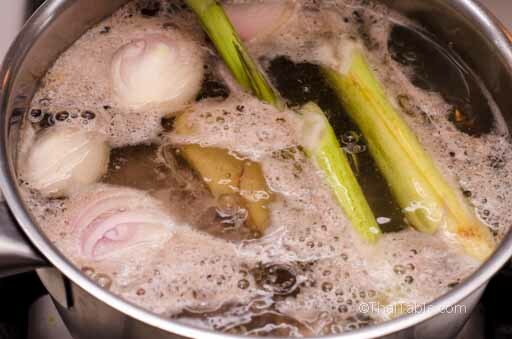 Keep the lid open and do not let it boil to keep the broth clear. 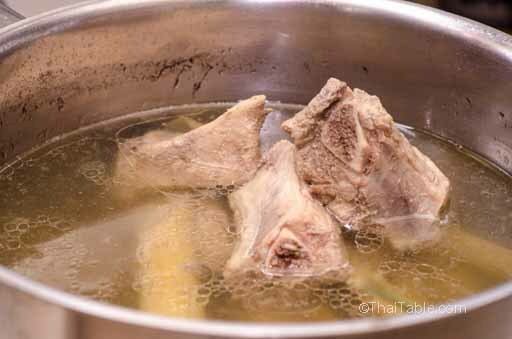 Boil the ribs for 50 minutes or until the meat is tender. The meat will shrink and bone will protrude showing the sign of tender meat. The broth is slightly reduced. The shallots will be translucent. Add the kaffir lime leaves and fish sauce. Take a taste and see if the broth is salty enough. Add the sliced chili peppers and lime juice, about 4 tablespoons or 1 large juicy lime to a serving bowl. Pour the hot soup in. Garnish with cilantro. Serve hot with rice or beer. 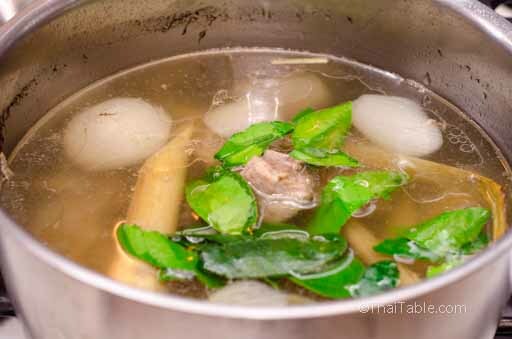 Note: Do not eat the lemongrass or galangal, they are for flavoring the broth. The kaffir lime leaves are optional but most people don't eat them either.